The 2010 local body elections have been one of the many highlights of my year, regardless of the outcome. I’ve had the opportunity to meet many amazing (and occasionally interesting) members of the community and have made so many new friends, friendships that I can only hope will last a life time. It hasn’t been easy. I was never the most likely candidate for this position. I lacked the experience and didn’t start off with much money or many endorsements. Our campaign was not hatched in fancy restaurants or cafes. Instead, it began in a lawyer’s office in the township of Glen Eden, filled with eager, budding politicians, just waiting to make that vital difference to the community they have come to love. We all gave it our best. As I reflect on this campaign, I cannot forget that it was built by hard working men and women who dug into what little savings they had to give to this cause. It grew strength from both the young and the old, many of whom neglected their homes, their families and their friends, for jobs that were only voluntary. It grew from the many who braved the bitter cold winds and rain to knock on the doors of perfect strangers, the many who put up and repair billboards during and after the storm, and the many who delivered the never-ending mountain of leaflets. Today, I thank you. I would not be here today without the unyielding support of my family, many waited impatiently overseas as preliminary results were released. In particular, I’d like to acknowledge my mum, my dad and my sister, who made sure I got to events on time and who walked the great distances with me to deliver pamphlets. My debt to them is truly beyond measure. I’d like to acknowledge my Future West running mates, those who worked behind the scenes, and Members of Parliament, who have supported me throughout this campaign. This could not have been possible without you. You should all be proud of what we have achieved and together we have grown stronger for 2013. 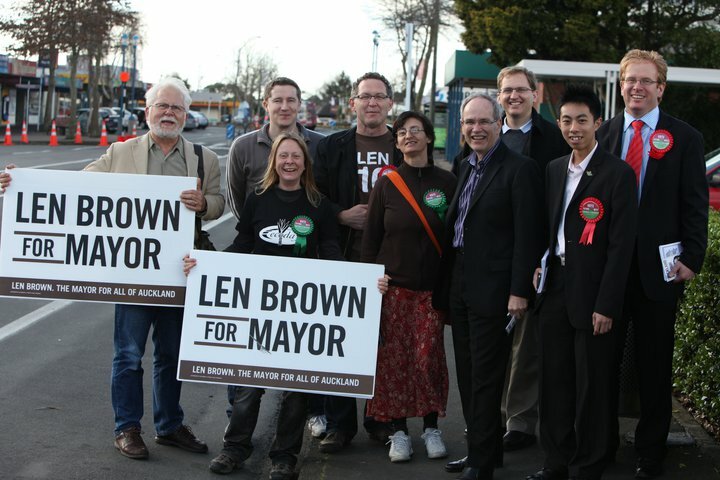 I’d also like to acknowledge the successful candidates all over the country, regardless of their political views, particularly the first Mayor-elect of the new Auckland Council, Len Brown. Finally, I wish to thank all my friends and supporters out there, both in Auckland and abroad. You give me strength to keep going and you give me the support that only few could ever receive in their lifetime. I thank you all. You are all wonderful people. To know that I have the support of over 4,000 Henderson-Massey voters is truly amazing. That is not something many 19 year olds could say, nor could they have their photos on billboards, in pamphlets, or in the paper. Not many could say that they have met the Governor-General, attended events with Mayor Bob Harvey, or have campaigned alongside the first Super City Mayor-elect, Len Brown, either. This has been a life-changing and memorable experience which could not have been possible without you. As the election slowly comes to an end, it’s time I take a short break – a break to spend time with my family and friends (and even the odd textbook!) who I have neglected over the past few months. It will be back to textbook politics for me for the next few weeks. My next focus will be my up-coming exams, before it’s back to the drawing board, planning the next phase in my exciting journey through life. This was my first time running for public office, but it certainly won’t be my last. It has been a privileged to stand as a candidate for the Henderson-Massey local board with Future West, something that many can only aspire to. I look forward to my next challenge and hope to have your continued support. As I told you earlier, I am super proud of you. You have made it further up with people that many of us only see on TV! I myself have worked in the youth council and what not but you have just gone further up from me, and that is just amazing my friend! As a new day goes by I grow more and more proud of you and your diligence, charisma and effort that you had put into the campaign – you have worked turly hard, and though the outcome wasn’t what we all expected – we know that you won’t give up! You are a great guy, a great friend and most definitely an enlightened individual with a future that only you may fulfill! Good on you Lincoln, sorry that you didn’t get in, but a great first run. You all had my vote!